They’re probably about half as old as scientists once thought they were. 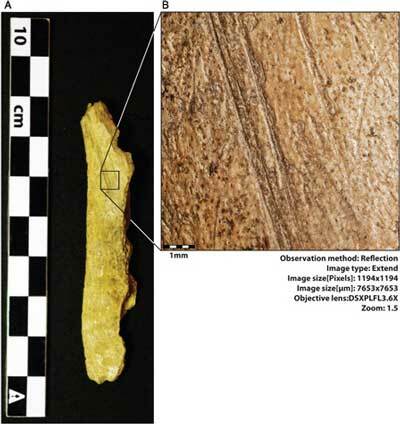 But a pair of butchered bones found in a cave near the Alaska-Yukon border are “definite” evidence of human presence in North America just after the end of the last Ice Age, perhaps as much as 14,000 years ago, according to a new study. The bones were originally discovered in the late 1970s by Canadian archaeologist Dr. Jacques Cinq-Mars at a site known as Bluefish Caves, high in northwestern Yukon Territory. In one of the caves, dubbed Cave 2, archaeologists found more than 18,000 fragments of bones from caribou, Yukon horse, mammoth, and other animals. Many of the bones appeared to bear the deep scrapes and sharp gouges associated with human tool use, suggesting that the cave was the site of an ancient, if temporary, hunting camp. But, quite controversially, some of the samples produced radiocarbon dates as much as 25,000 years old — considerably older than conventional estimates about when the Americas were first populated. “The history of the Bluefish Caves has been controversial for a very long time because of the hypothesis that modern humans were occupying the site at around 25,000 years ago, which meant an earlier migration at a time when the climate was very cold and dry,” said Lauriane Bourgeon, a graduate student of anthropology at the University of Montreal. In addition to the problematic dates suggested by the samples, the material from Cave 2 was too heavily fragmented and disturbed to provide a clear picture of what, if any, human activity had once transpired there. In time, the findings from the caves were largely dismissed, or forgotten. “But it was clear that the Bluefish Caves have a huge potential to feed our knowledge about the first peopling of the Americas,” Bourgeon said. So she undertook a new study of the Cave 2 materials, with a focus on taphonomy, the study of how environmental conditions can affect the preservation of biological remains. “A bone fragment observed under the light of a stereomicroscope has a lot to say,” she said. After studying 5,600 bone fragments from Cave 2, she concluded that the vast majority of the scrapes, cuts, and other marks on them were the work of carnivores scavenging meals from the remaining gristle and marrow. But at least two of the objects, Bourgeon said, bear clear indications of having been modified by human hands. The first is a piece of pelvic bone from a caribou bearing striae, or striations, that are deep, straight, and parallel. “That is typically the mark of a stone tool used to de-flesh or disarticulate a carcass,” she said. “Carnivore gnawing would have been different, since tooth marks leave larger grooves with no striae inside and a U-shaped profile, while cut marks have a V-shaped profile. The other possible artifact is a length of leg bone, likely from a Dall sheep, that appears to be etched with long, lengthwise grooves. “Carnivores can definitely not be responsible for that one,” Bourgeon said. Such signs of post-Ice Age human habitation in the region are by no means unique to Cave 2, she noted. 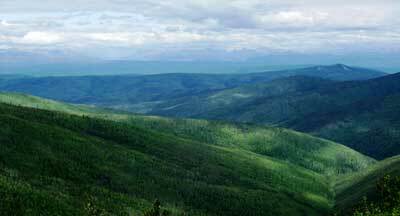 “Several sites in Alaska have been excavated and have provided new clues, allowing us to accept a first entry of modern humans in these regions around 14,000 years ago,” she said. And although only two of the 5,600 samples show signs of human use, such a scarcity of artifacts at sites like these is not unusual, Bourgeon added. “The low amount of cultural traces on a bone assemblage is not surprising,” she said. And while the fact that the bones were fractured into thousands of pieces can make them difficult to study, that in itself could be a sign of an ancient human presence, she added. “What is also interesting about this bone assemblage is the high fragmentation,” she said. “When carnivores leave bones behind, they are usually altered but relatively complete. “Humans, however, used hammerstones to break the shaft and extract its marrow. They could also break the epiphysis [the rounded end of a long bone], to boil them and extract the grease. While new radiocarbon tests are needed to date the two artifacts, Bourgeon said their age would likely fall in the range similar to those found at other well-documented sites in the region, from about 10,000 to 14,000 years ago. The initial dates obtained in the 1970s, she added, were probably the result of older material in the cave having been churned up by animal activity and other natural processes, including thousands of years’ worth of freezes and thaws. So despite the impressions first gleaned from the site, not all of the detritus found in Cave 2 was produced by humans, and the prospect that people lived there 25,000 years ago seems unlikely at best. “But I can definitely confirm that Cave 2 was occupied by modern humans probably at the very late Pleistocene, during a period of global warming, and that they fed on medium-sized ungulates such as caribou and maybe Dall sheep,” she said. This has important implications, Bourgeon said, for a site that — though long overlooked — can still provide hard, new data about some of the earliest human history in the Americas. “This study brings the Bluefish Caves out of the shadows and adds it to our archaeological database in Alaska and the Yukon,” she said. “It’s giving more clues about the history of the First Americans, when they arrived and how they survived. “We know now that they hunted caribou and maybe Dall sheep and that they occupied the caves in the north of the Yukon Territory to butcher and feed on the carcass. Bourgeon reports her findings in the journal PaleoAmerica.